Well, The Husband is back! And this week, he is FULL of opinions when it comes to Tiger’s Curse by Colleen Houck! Be forewarned friends…He has quite a few spoilers throughout while giving his opinion! Enjoy! Ok…so it’s time for a little confession. I was not looking forward to picking this book back up – at all. I dragged my feet as long as I could because as interesting as the developments in chapter four were, it still wasn’t enough to make me eager to pick it up. In fact, the more I thought about the first four chapters, the more I realized that I wasn’t really getting Kelsey. I mean, seriously, what kind of girl agrees to go across the globe with a man that she just met? By the way…what kind of parental figures allow a teenage girl to go across the globe with a man they just met? I mean…I know this is a work of fiction, but at the end of chapter four I was bothered by it. Couple that with a main character that I don’t love, and you have some serious feet dragging. That being said…I picked up Tiger’s Curse again last night and very quickly found myself burning through five more chapters. The story finally picked up for me right about the time that Kelsey finds herself abandoned in a small village in India with just her backpack and a tiger that, incidentally, isn’t caged or restrained in any way. Kelsey decides to follow the tiger, Ren, into an unknown jungle. I have to say, that I have read several books with pretty out there story lines. Everything from girl falls in love with vampire and then realizes that best friend is a werewolf, to a girl who can kill through simple contact with her skin, but for some reason it was easier for me to feel invested in these stories more quickly. To be honest, I think that it has everything to do with how I feel about Kelsey at this point in the story. As a 30 something guy, I’m not really enjoying this dreamy eyed affection and connection to a tiger. However, I was completely sucked into the story as a whole. Eventually, Ren leads Kelsey to a small hut deep in the jungles of India. There he proceeds to turn into a human and introduce himself to Kelsey. Here again, I was disappointed in Kelsey’s response to Ren. I don’t know about you, but if I were walking through the jungle with a tiger and that tiger suddenly turned into a human, I might be a little more than confused. She accepts his story with relative ease and then is more upset by the fact that she wasn’t told up front that “Ren the tiger” was actually “Ren the Indian prince”. Now…to be fair she seems to be more than a little distracted by the fact that she thinks he’s extremely good looking. Ren offers a very basic explanation of his predicament. I will say that I did especially like the fact that Ren is only human for 24 minutes a day. I just thought that was a cool twist. Anyway…Ren needs Kelsey to break a centuries old curse. Apparently, there is something really special about Kelsey that will undo Ren’s curse. There are hints that Kelsey possesses some inner strength or there is some greater plan at work that makes me hopeful that I will someday soon become more invested in Kelsey. Because, believe it or not, I do want to like her. Listen…I know that I’ve been kind of hard on our main character. I’m not crazy about her yet. But…today I found myself actually looking forward to reading more – wondering if I was going to have some time to pick it up. I am definitely no longer dragging my feet with this book. I’m totally interested, and honestly I’ve started to truly enjoy reading it. So…don’t let my qualms about Kelsey deter you from reading on. I’m not. 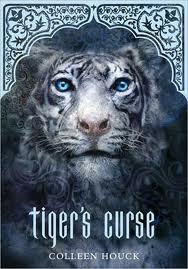 The first book in the series is called Tiger’s Curse. My intention when starting this process was to take the book about three chapters at a time and give you my thoughts. However, at the end of the first three chapters I had nothing to say. Nothing had really happened yet. To be truthful…if it had not been for the intriguing prologue and my commitment to read the whole book, I don’t know if I would have continued reading. The first three chapters started a little slow for me. Kelsey seems likeable enough. I’m not feeling any kind of instant connection to her, but I’m only a few chapters in so I’m hoping that will change soon. I pushed into chapter four hoping that the story would pick up, and I’m glad that I did. A stranger has appeared and he is full of mystery. I’m not sure how to take this guy, Mr. Kadam. He seems nice enough, but there’s obviously a lot that he’s not telling us. So when he offers Kelsey the chance to accompany the white tiger, Ren, to India, I am naturally cynical about the nature of this trip. And…I’m sure that was the point. I am all the more interested in finding out how this trip goes because I know there is more than meets the eye. So…Colleen Houck your little trick worked. I want to read more. I am interested to see what becomes of Kelsey and this white tiger that she has developed such affection for. What’s the real story of Mr. Kadam, the guy who bought Ren so that he would bring him back to India? Why does he feel responsible his capture? What’s up with this tiger who behaves so strangely?